[tweetmeme source=”leanisgood” service=”ow.ly” only_single=false]Delighting customers with a high quality product that performs to expectations is one of the best ways to secure and grow a business. This results in long term security for each player in the extended value stream. Today I’d like to discuss a couple of perspectives on manufacturing quality products and how it affects customers. One of those perspectives eventually relates to football, so hang in there with me! More often than not, customers measure the quality of a product by how much inconvenience it causes. This means when a product under performs, customers have to spend more money. This may include buying additional product, downtime of their equipment, and all the associated costs of their staff dealing with your poor product. Eventually, these inconveniences and increased hard and soft costs force the customer to find a different manufacturer. In a manufacturing plant, we often can’t directly measure the performance of a product exactly as our customers will using it. We try to translate the product performance into manufacturing specifications and tolerances. We work with these specifications everyday throughout the process of turning raw materials into a useful final product. Because all processes have a natural variation, each of these specifications have a target value and an upper and lower limit. Commonly in manufacturing plants when we are making a product, as long as we measure the specification and it falls between the two limits we pass it along and assume it makes good quality. A good analogy to this is a field goal in football where the specifications are the goal posts. As long as the ball is kicked between the goal posts it’s worth 3 points, whether it is right down the middle or grazes one of the posts! We often view quality in our plants in the same way, as long as it passes within the limits, it’s a great product. 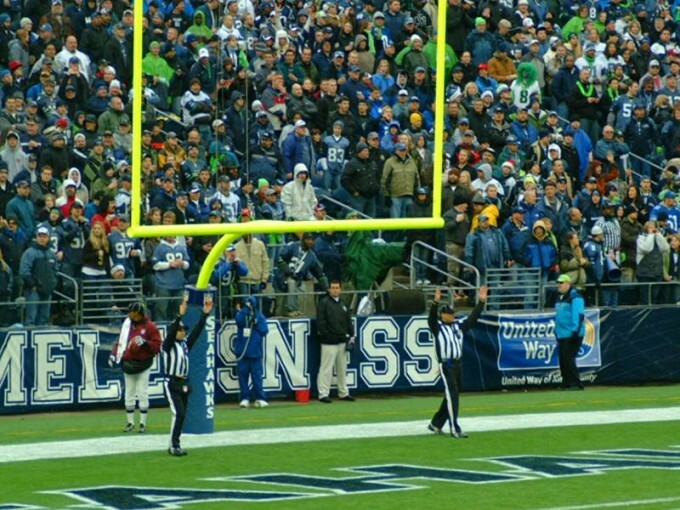 We assume the widget made right in the middle performs just like the widget that “grazed the goal post!” This is what is known as goal post quality. Is this the best methodology to look at our quality? Let’s look a little closer at the situation and take a specification like radial run out of a tire. If the specification for tire is a maximum 0.025″ of run out, do you think a tire with 0.005″ of run out performs the same for the customer as a tire with 0.025″ that barely passes specification? Of course not, the second tire will have increased vibration seen by the customer, thus decreasing their satisfaction. We write the specification intending to only cause a minimal dissatisfaction that the customer will hopefully not complain about. This is also true internally in a plant as well. If a supplying process provides material that is within specifications but very close to the limit, the next operator experiences varying levels of inconvenience when processing the material. This same example can be seen throughout the value stream and I’m sure you’ve all experienced it. Components that are within specification, but since they were close to the goal post, make it harder to make product! 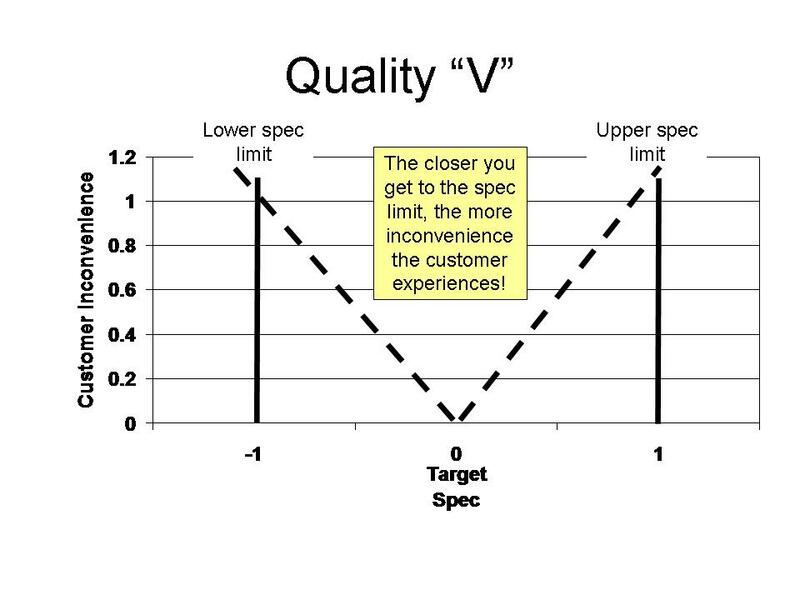 In reality, quality is not like a goal post, its more like a V. The farther away something is from the target the more cost, inconvenience, and dissatisfaction it causes. That is why a major key to improving customer satisfaction is reducing process variation so everything runs as close to the target value as possible. The best tool to do this is process control charting or SPC charting at the equipment when building the product. This tool tells us when our process is varying too much and we need to make corrections. It also tells us when the variation is only our natural process and to not over adjust it which is just as big of problem! 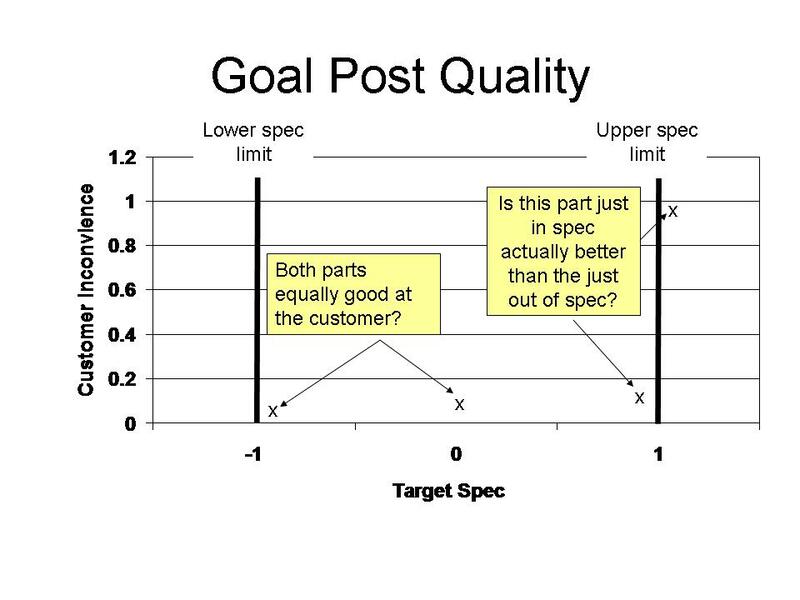 The main point of SPC charting is to measure our performance with a “V” and not as a goal post. If you implement SPC properly and improve your processes, it will not only make your customers happier, it will also make it easier to make your product. This of course reduces costs which increases your competitiveness. So remember to strive to keep your processes running near the target specification and not just “grazing the goalposts!” The “V” is for victory! Thank you for a great article, I will share it with University of Houston student organization ISM Bauer members on our website as well.